What if there was a really simple way to improve your health and build up your body’s immune system? What if it was as simple as drinking more water? But not just any water – molecular hydrogen enriched water. Hydrogen water is water that is infused with hydrogen gas (H2). The benefits of drinking hydrogen water has been around for many years, but only recently has it hit mainstream media and the general public. Molecular hydrogen (H2) is a tasteless and odorless gas that has been discovered to have therapeutic benefits for essentially every organ in the human body. When added to water it binds to the water molecules and easily gets into your system. The medicinal properties of molecular hydrogen appear to be promoted as early as 1798. Many years later in 1975, the departments of Biology and Chemistry from the prestigious Baylor University and Texas A&M published a great article on the potential use of molecular hydrogen in medicine in the premier peer-reviewed journal of Science. However, it wasn’t until 2007, when an article was published in Nature Medicine, which showed the selective antioxidant properties and antiapoptotic (anti-cell death) activity of molecular hydrogen, that the biomedical field took strong interest in hydrogen’s therapeutic potential. Since then, there have been over 700 scientific studies covering over 170 health related issues and over 500 peer-reviewed articles all discussing the amazing health benefits of molecular hydrogen. Hydrogen molecules are the smallest molecules in the universe. They can cross barriers in cell membranes, mitochondria, nucleus and DNA. How Does Hydrogen Work In The Body? Molecular Hydrogen (H2) can help your body in two ways. First it’s known as a selective antioxidant – it neutralizes only the cytotoxic free radical cells – the cells that cause damage to your body. And the second benefit of using molecular hydrogen is really a bonus because it appears to stimulate the production of the body’s own antioxidant system. This results in the production of more protective enzymes (antioxidants) such as glutathione, catalase, and superoxide dismutase. How Do You Drink Hydrogen Water? Hydrogen water is simply water into which hydrogen gas has been dissolved. You can buy it premade in bottles and there are all sorts of expensive machines and gadgets to use at home. The issues with these options are they can be expensive, hard to clean and all typically produce between 0.1 – 0.5 PPM of H2 which is very low. Make Your Own Hydrogen Water – Anytime. Anywhere. There is a much simpler way to ensure you are getting fresh hydrogen rich water. And why is that important? Hydrogen, being a light gas, will evaporate quickly if left out in the open. 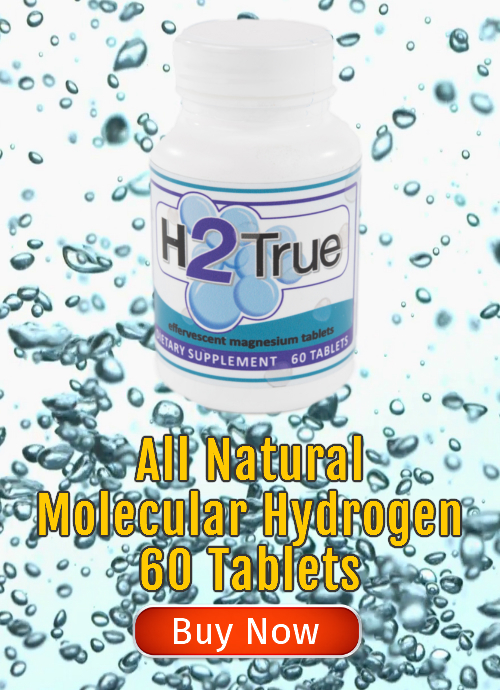 You can make your own hydrogen water the easy way using H2 True tablets. Our tablets are capable of producing enough H2 to saturate 500ml of water with 13 PPM*(parts per million) of H2; this far exceeds what any of the other methods can achieve. By contrast, both ionizers and hydrogen sticks typically produce between 0.1-0.5 PPM of H2, while degrading in performance over time. Drop one tablet in 12 – 16oz of water (filtered water is preferred). Tablets typically dissolve within 1 – 2 minutes in 12 – 16oz of water. Wait until the last remaining bit of the tablet rises to the surface; stir lightly and drink immediately. Very easy!